All week long I am hosting a series of craft room tours. 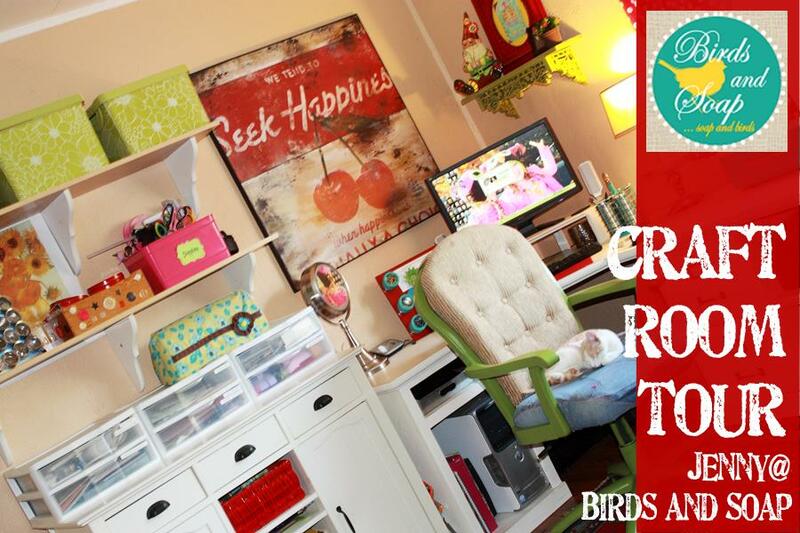 Tons of bloggers are joining me to give you a glimpse into our creative spaces. I went first and you can see my full craft room tour here. This is day 1 and we have 6 lovely ladies that are revealing their creative areas today. Click around below to visit each one. Then come back here tomorrow to get even more fun craft room tours. Up first is my friend Michele from The Scrap Shoppe. Michele has an amazing and creative blog plus an etsy shop. She actually lives fairly close to me so we meet up regularly. There is a little teaser picture of her area below. I love the aqua and white color scheme she has going on. And a mason jar on a pedestal to hold pencils?? Yep I am in love. Click here to see the full tour of Michele’s creative area. Up next is Mandy from Sugar Bee Crafts. I am thrilled that she is joining in because I have admired her area on her blog for a while now. 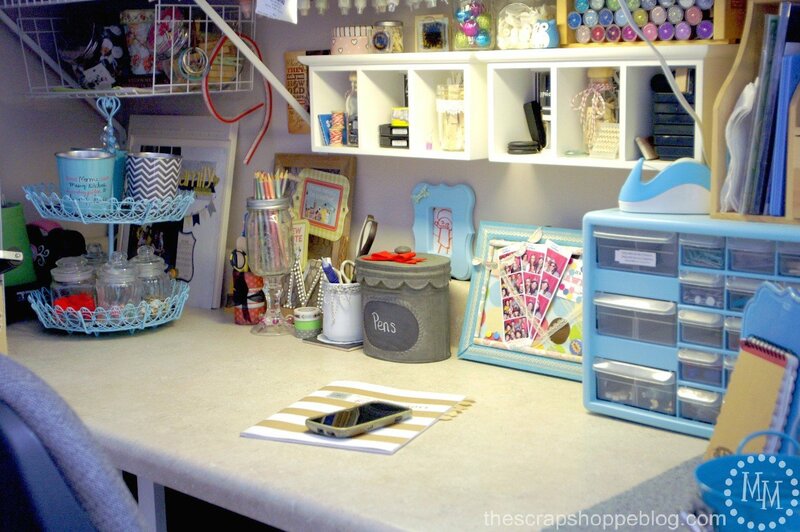 She has tons of great craft organizing ideas that you really must see. Those buckets along that top shelf in the back are one of my faves. Plus just look at all that seating. Her hubby blogs too if y’all don’t know already. 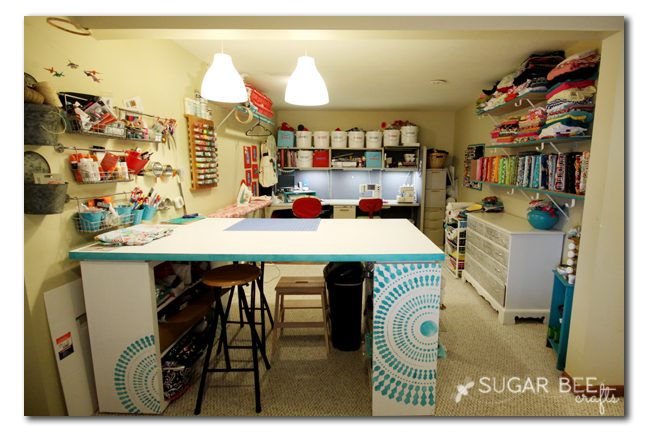 Head on over to Sugar Bee Crafts to get the details on Mandy’s craft room. So far on the tour, the spaces have been full of really bright colors. 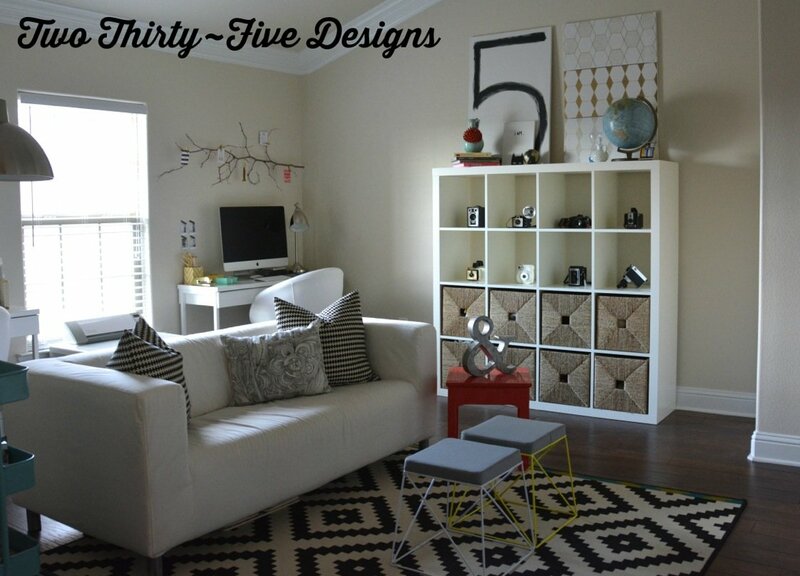 You can also have a creative area that is elegant and sleek like this one from Two Thirty Five Designs. I swoon y’all. The vintage touches got me I must say. I love a mixture of vintage and modern and Allison nails it every single time. Click over here to see the full tour of her creative area so you can swoon a little more. I had the pleasure of meeting Amy the fabulous creator and artist at Plucking Daisies in January. She has a huge studio in her unfinished basement. Seriously it is huge y’all. You really must see the pictures to believe it. So many wonderful craft supplies and creative items in one place. Amy thanks so much for showing off your space you are a rock star! Y’all click here to see the entire tour of this massive craft studio. Jenny with Birds and Soap is up next with an adorable Craft Room Tour. Jenny has a bright and colorful creative space that would be amazing to work in — don’t you agree? She can send me that amazing desk as well as that huge Seek Happiness sign. What is your favorite part of this tour? Click here to see the entire tour of Jenny’s craft room. Last but certainly not least is Vanessa with Tried and True. Vanessa did not have an extra room in her home for a creative studio so she carved out a small space to house her supplies. This just goes to show you that anyone in any home can make an area for creativity. 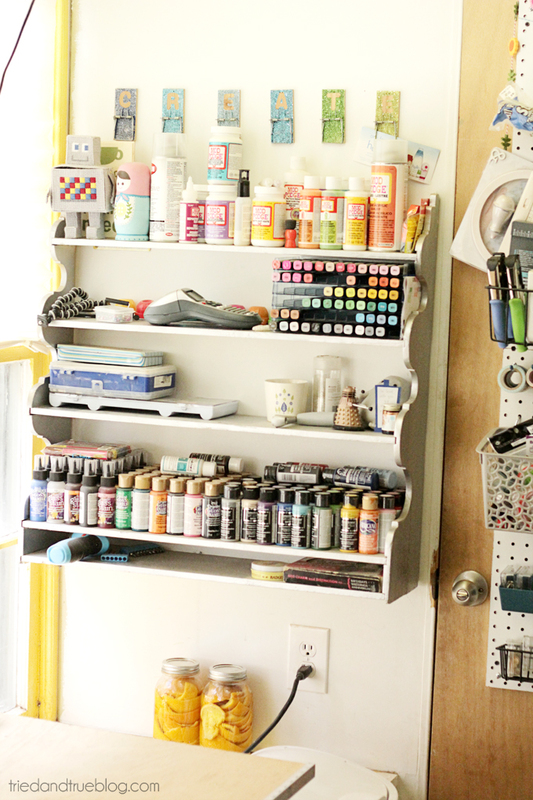 Click here to check out Vanessa’s teeny tiny craft room. I hope you enjoyed our craft room tours for today. Stay tuned as we have tons more to come this week. By the end of the week you will be itching to makeover your own space. If you miss any of the days of the tour, I will be sure to link them all at the bottom of my craft room tour post. Don’t miss the inspiration and organization all week right here! 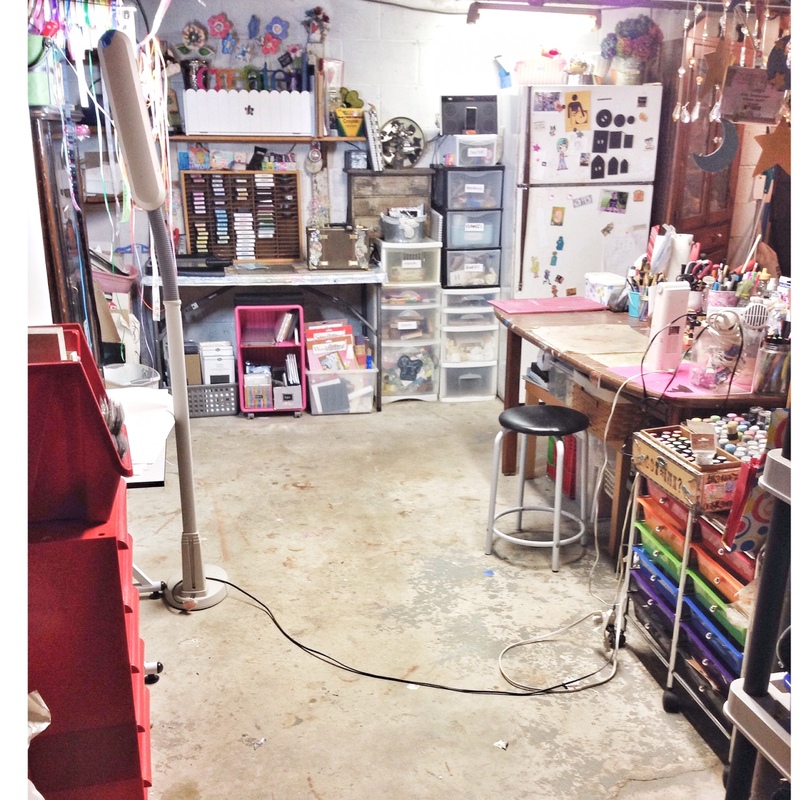 previous post: My Craft Room Tour and tons more next week! Love being grouped with all of these girls!! Thanks so much for all of your hard work on this! Thanks for letting me participate in the craft room tour! Already so many inspiring spaces!